Not fixed. But dramatically and unbelievably better! It’s like someone switched the lights back on in my body! And now I look back I can see that I was degenerating badly. It’s actually quite scary now I feel better, to see how I was on an inexorable spiral downhill. It was obvious if you had a little look at my house or Espiritu, which had become untidy and clogged up; I’m a lover of systems and organisation and the mess was a sign of my overwhelm. Now I’m not underestimating the general stuff I was doing, CBD oil (since Sept and crucial for getting me out of bed), and more recently a naturopath (great for support, knowledge of Lyme and starting the healing process). But this change was sudden, has continued, and is continuing and is all down to the Far Infrared mats from Get Fitt. Physical stamina and strength improved dramatically (I can walk the dog on the same day as Pilates and am at last up to my old weights on my legs on the Stott Reformer machines). Pain reduced, even during period (normally chronic). Brain fog, depression and overwhelm blown away (Business decisions are about 50times faster and life is generally much sunnier). A few weeks ago I got a message from Lisa from Get Fitt. I’d heard of Far Infrared and even tried a sauna, but I was feeling so ill it took 2 weeks before I felt I had enough stamina to ‘waste’ talking to someone for 30mins. On Friday 18th March she turned up with Mark the founder (a very passionate guy with that endearing ‘mad professor’ way to him). They sat me on one of their chair mats for 10 mins (I was too sick for more apparently) and explained the science behind it. Helps regain energy from over doing life. Who can’t go on it? Pregnant women and haemophiliacs, that’s all. Off they went, and I was left with the feeling that they were really lovely people. Then the magic started to happen. Myself and one of my stylists reorganised the whole of the colour area at work, which required puzzle solving skills I’d been completely lacking for weeks and physical graft. I should have been dead that night, but I was ok. I was fine on Saturday too. Sunday morning and it went PFFT (technical term!). OMG it was gone and suddenly I felt like I did before – it was a shock to remember how bad I had accepted feeling. So I cheekily messaged them saying I needed another demo; after all it could have been coincidence. This time they popped me in their Professional Sol Cocoon. Monday, Tuesday & Wednesday were amazing – I spent time with the kids, solved business problems in 5 mins that had been troubling me for a week and started to sort through the mess at home and the salon. There was NO way I was going without it anymore – it was definitely my new addiction. A beautiful Amethyst Chair mat (the earth pad) as a lovely upgrade to blow drys, manicures & pedicures and help clients with back pain, tiredness and PMT. The Professional Cocoon Sol for those needing it therapeutically like me, pain relief and clients who had pushed themselves too far; basically more of a relaxing and healing experience, all on it’s own or following a Spa treatment. BUT I took the cocoon home and the continued improvement was so good, that I decided to keep it home during the Easter holidays. I’d at last learnt the lesson to put myself first. When faced with a week in a caravan and no mat I realised it was never going to be enough for me to just use the mats at work, so I bought myself a chair mat (the Super 7 body mat with 7 different crystals and minerals) for home. So what have I achieved that is so extraordinary? I ran a 3hr training course, standing up the whole time, that I’d prepared for late into the evening for 4 nights running as it was the Easter holidays. With no fall out the next day in pain levels or exhaustion. I went to Ikea with 2 children; a 4hr round trip, including lugging boxes and an amount of walking that would normally have killed me. I went to a wedding; normally a nightmare for noise and people overload. I didn’t rest the day before, and just had a quiet day afterwards. I had FUN! And I DANCED for an hour! I’ve reorganised the whole of the downstairs kitchen, utility and playroom, and my bedroom, which required a lot of physical graft and organisation skills, I’d been lacking for months. 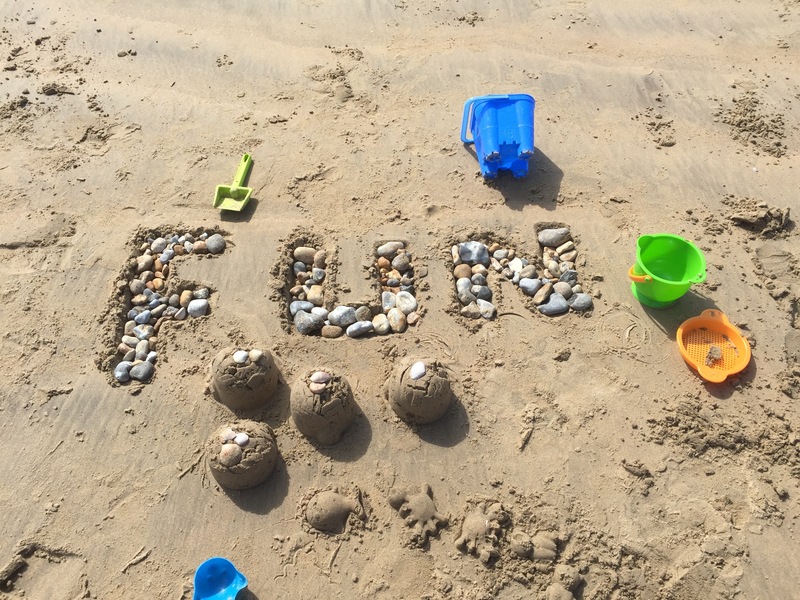 I took the kids on holiday for 5 days ALONE to Park Resorts at Camber Sands, and although I was tired (what parent wouldn’t be), I had a wonderful time, as I was able to actually BE present with the kids properly. We played on the beach (so I didn’t just sit and watch them play like normal), went swimming in the pool every day, and I just needed a couple of gentle days on our return to recuperate. Within a couple of weeks I was back up to my original pre-June 2015 leg weights/strings on the Stott Reformer machines at Applied Pilates. My upper body, is still weak, but the constant feeling of constriction, like my arms were in bandages has gone. I’m not having to constantly ‘count spoons’ as us Fibro/Lyme people do, worrying that I’ve taken too many steps in a day. Work wise, I’ve been back ‘on the ball’. It’s actually really scary to think how much I’d degenerated, I was really scared that the Lyme had gone to my brain, but it looks like it was just lack of oxygen. And it’s not just me! So far my kids go on it once-twice a day especially little dimples; it helps when they are tired and reduces tantrums. The big hairy northerner has used it to recover from migraines and exercise, and his Dad was a big fan (he’s not the type to be easily persuaded about anything). It’s helped several friends with their backpain, but I want to investigate further to see how long the improvement lasts for. It definitely dramatically reduces the pain and grumpiness of PMT in a couple of my girls at Espiritu. The Amethyst Chair mat (or earth pad) has been in regular use, as much by my girls as clients over the last couple of weeks, so I’m really excited to catch up with everyone to see what happened during my holiday. So tomorrow the Cocoon goes to the salon (boohoo!) and I’m very excited to see what magic it can create for my clients on it’s own as an experience, or as an upgrade to Facials. I hope to see just as dramatic differences as it seems able to help a massive list of problems. I’ll be offering it out for free for the first week and contacting as many friends and clients as possible. Then it will be at a reduced price for the second week for those who couldn’t make it. But I’m also thinking of permanently having a day where it’s heavily discounted, to help those who need regular treatments. I’ll write more soon, but I want to let you know that I’m better, and it’s been a month, so it’s definitely lasting and continuing to improve even more. Update: Read my second review here. If I was better what would I change? Wow!!! What wonderful news. Yeah!!! So happy for you and your family. Sending hugs. Thankyou so much for letting me know Catherine, how are you doing, is it helping? I’m not sure, its early days. When you first got yours, how often did you use it, at what temperature and for how long? In the first week of demos I used it 3 times, 10, 15 and 20mins at a low temp – maybe 50 I reckon. Once I got it home I used it every day, gradually increasing from 10mins to 10mins twice a day, to more until it was 30mins + 10mins each day. I haven’t really gone above 55/60 degrees though. I recommend you really make the most of the detox program and call Get Fitt lots – they have lots of knowledge, but you need to be proactive to get it out of them. Discuss how you feel after each time you use it. Can you find me on Facebook? Then we can have a chat about it there. Have you continued to see benefits from using the Infrared products? Could you describe what additional improvements you have experienced since you wrote your bogs? Thank you very much! Good question Ayesha – I need to do another blog post in the next couple of weeks. I’m doing loads and loads and loads of case studies, so I’ll include their results too. But put quickly I’ve sadly discovered I’m too sick for the chair mat to do more than help me maintain my results – it’s nice, and I’m glad I’ve got one for going away, but it’s not strong enough for Lyme. Only the professional cocoon helps me when things get bad. Now it’s at the salon I’m not making as good progress, whereas beforehand I was using it daily. I think I’m going to have to face facts and get my own. At least it means I can advise people on the best one to buy though – otherwise I would have been tempted to recommend the chair mat to chronically sick people. Where in U.K. can I buy a far infrared sauna mat? Hi Sue, this is a review of the ones from ‘Get Fitt’ – you can also get cheaper versions from Amazon, but I’m not sure how good they are. I think Firzone is another manufacturer.